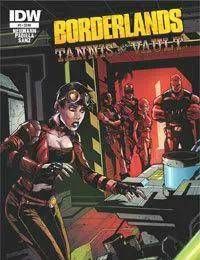 The Vault Hunters have narrowly escaped Nine Toes and find themselves lost and unable to find the fabled “Vault.” Enter Patricia Tannis—a brilliant scientist whos struggling to cling to reality… and who is the Hunters only hope of reaching the Vault. But can they trust her? Return to Pandora in this all-new, action-packed arc!